While the scale of the IFRF program keeps growing year after year, the long term objective of the organization is to simultaneously strengthen itself from a sustainability point of view so as to ensure that it is able to maintain and grow regardless of the status of its PPP arrangement. It is still a long way from achieving this objective. Total Income: IFRF’s fund inflow has been on a constant rise over the past few years. The total income in FY13 amounted to Rs665mn, which has increased by almost 2.5x the total income in FY10 (Rs275.7mn). 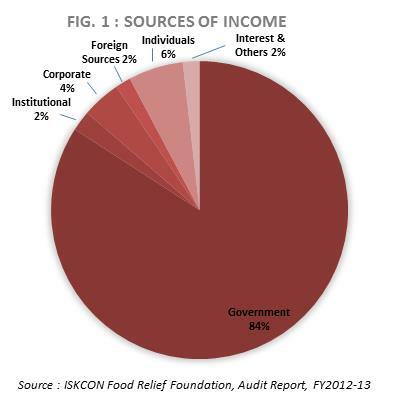 Income from Government Sources: IFRF relies mainly on government funding, either through grants or reimbursement of cooking expenses through the PPP agreement. Income from the government accounted for approximately 84% of total income in FY13, and has been about 79% of total income on an average in the past four years. Income from Foreign Sources: IFRF’s reliance on foreign funding is minimal, averaging to about 1% of the total income over the past four years. The quantum of funding received from foreign sources in FY13 amounted to Rs11.2mn. Income from Corporate, Institutional and Individual Donors: The relative dependence on funding from these sources is low by comparison, ranging between 2-4%. Funding from these sources is mainly from the Maharashtra region and amounted to Rs27.9mn, Rs14.7mn and Rs39.5mn respectively in FY13. Income from Investments: On an average, income from investments has formed less than 1% of total income. Total interest earned in FY13 was Rs5.6mn. The balance of investments as at FY13 year-end amounted to Rs54.2mn. Fixed Assets: Fixed assets held by IFRF as at FY13 year-end amounted to Rs249.5mn, of which 17% (Rs42.8mn) is attributed to immovable assets in the nature of land, building and kitchen infrastructure. There has been an increase of about 59% in immovable assets from FY12, owing to the setting up of a new kitchen in Aurangabad. Fundraising Expenses: Expenses on fundraising activities have seen a significant dip in FY13, being only Rs1.1mn, as compared to expenses of Rs2.4mn in FY12 or Rs6.8mn in FY11. They formed just under 0.2% of total expenses. 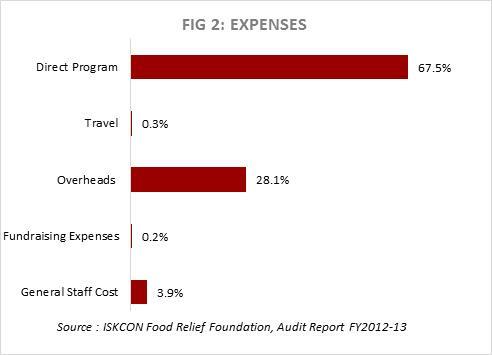 Overheads/Program Expenses: Expenses on direct programme activities constituted 67.5% of total expenditure, while overheads formed around 28%. It may be noted that a large part of the overhead expenses, which aggregated to Rs143mn in FY13, are on account of rent, electricity, water, transportation and maintenance, which are costs related to kitchen operations and food preparation and distribution. Corpus: IFRF has a corpus of Rs302.7mn for FY13, which has increased by 25% Y-o-Y (FY12 corpus Rs241.8mn). The Trust has set a target to raise Rs1bn towards the corpus, in order to provide a safeguard in the event of non-renewal of the PPP arrangement with the Government. Loan Liabilities: The outstanding loan balance stands at Rs43.5mn as on FY13 year-end. Loans have been primarily sourced from the ISKCON temples (46%) and ISKCON centres (23%) across the country. Trends in Surplus and Deficit: A deficit of Rs4.1mn was carried forward from FY10, after which the years FY11 to FY13 have had carried forward surpluses of Rs9.6mn, Rs1.8mn and Rs26.5mn respectively. It may be noted that while FY13 actually had an excess of expenditure over income (deficit) to the tune of Rs1.6mn, adjustments being “errors in opening balances” of the branches in Gurgaon, Ujjain and Tirupati amounting to Rs26mn have resulted in the high surplus balance being carried forward from FY13. Income Growth Rate (IGR): IFRF has a healthy IGR in the range of 29-37%, although it has been marginally declining over the past three years. The largest influencing factor to this, however, is the reimbursements from the Government, as other sources of income have either slightly increased or decreased. Self Sufficiency Ratio (SSR): The SSR was in the range of 6-9% in FY11 and FY12. In FY13, the classification of donations under various sources was available only for Maharashtra, therefore, individual donations of Rs39.6mn may be overstated as these may include non-individual (corporate, institutional) donations from other states. Therefore, the SSR of FY13 cannot be accurately derived. However, we can conclude that the SSR of IFRF will be in a very modest range, as a large part of their funding comes from the Government, and is reviewed for renewal every year (i.e., not committed in the long-term). Lack of adequate support from Government: The Government reimburses cooking charges to the extent of Rs3.02 per meal. However, this is not adequate funding as the actual cost per meal amounts to Rs4.5, after including overheads and costs for cleaning of the rice sent by the Food Corporation of India. Therefore, there is a per-meal deficit of Rs1.48 daily, which when extrapolated to the 1.2mn beneficiaries amounts to a large deficit of about Rs2mn per day. This has to be separately raised by IFRF from other sources. Additionally, it costs Rs35mn to set up a kitchen, which again is a cost that must be borne by IFRF. Fundraising to meet the gap in government funding, therefore, becomes a major challenge for the organisation. Short-term commitments by the Government: While corporate and individual donors are more likely to keep supporting the program for in the long term, the Government, which is the biggest source of funding for IFRF, renews the mid-day meal partnership on an annual basis, by inviting tenders from IFRF and other organisations. There is a risk of the orders being given to local NGOs and self-help groups, particularly in the areas where the local community is active. Therefore, there is some uncertainty about Government support being available long term. The Board of IFRF is composed of senior individuals from varied professional fields, ranging from social work to finance to dentistry. Three of the trustees also serve on the Governing Body Commission of ISKCON Worldwide. IFRF is the recipient of a number of awards for its program, including the Lifebuoy National Child Health Award, the D.Y. Patil Annual Achiever’s Award and felicitation by the Malad Student Welfare Association and the Indian Development Foundation. IFRF is registered with Give India and GuideStar.